Arrive at Delhi international airport, you will be received by the representative of Htoi and would be further assisted and transferred to your hotel. Rest of the time is kept free to recover from jetlag. Stay overnight at the hotel. Nanda Devi TrekIn the morning, transfer to Delhi railway station to board the Shatabadi Express train to Haridwar. Arrive at Haridwar, transfer to the auspicious place Rishikesh which is the Yoga capital of the world and gateway to the Himalayas. It is the home of various adventurous activities like White Water River rafting, trekking and hiking. Later visit Lakshman Jhula (450 feet long suspension bridge), Ram Jhula, Bharat temple, Swargashram temple, Geeta Bhawan temple and various other temples and Ashrams. Also take an excursion to Nilkantha Mahadev temple (12 KMS away from the town) it is located at a height of approx 5000 feet). From here one can have a spectacular view of the area. Stay overnight at the hotel. Nanda Devi Trekking TourAfter having breakfast leave Rishikesh for Almora. In the evening arrive at Almora and check in to the hotel. Nanda Devi BasecampToday the road journey would be incredible by the wooded hilly areas having fabulous views of the mountains. Arrive at Munsyari and check in to the camp. Trekking Tour IndiaIn the morning drive half an hour and meet to the mixed horses team. Today follow upstream the Gauri River Ganga and trek down to 1500 meters. Later climb softly towards the camp and have lunch in Lilam which is located by hillside. Stay overnight at the hotel. Uttaranchal Trekking Tour IndiaIn the morning complete the formalities at Indo - Tibet Border Police checkpoint and climb through the broad and nicely made track which shows the recent good relation of India and China and the border is opened for the limited business. Stay overnight at the tent. Trekking In Himalaya'sToday, trek to Raillkot. In spring months, this track is full of shepherds and the snow clad bridges. View the first time the snow covered peaks and cross by the shrines towards the gods of mountain top. After climbing for three hours see an apparently insane track located highly. From this trail view the peaks at 7000 meters and have the lunch. Now walk through flood mixed paths and visit a fort located on hilltop at Rialkot. Stay overnight at the camp. Nanda Devi Trekking campIn the morning walk to Martoli and further trek Pachu valley. On the entrance of Pachu Gad there is a lesser covered valley that has a view of Nanda Devi and Tirsul mountains. Stay in the camp located at the square of the village under the house of the headman. You may see here the Nanda Devis images carved on the doors. Few homes have pretty carved doors of wooden, the windows frame and the cautiously walled field under are abandoned. Stay overnight at the camp. Milam TrekkingToday the track will go to Pachu Gad having the superb views of Nanda Devi and Nanda Devi East. Our target is a meadows series under the snow peaks. The sunsets out here would be incredible. Stay overnight at the camp. Milam Glacier Trekking TourToday return back to Milam. Stay overnight at the camp. 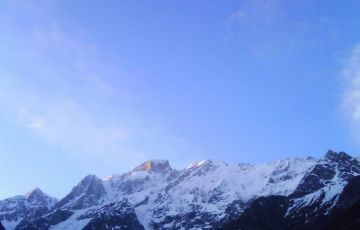 Nanda Devi Milam Trekking TourToday take a day return excursion of Milam Glacier (4100 meters). Here would be the outstanding view of the spotless ice exposed by wreckage during the trekking tours that goes by the Milam Glaciers left bank. Stay overnight at the camp. Milam Trekking Tour IndiaToday, trek far from Tibet border towards the humid gorge. Stay overnight at the camp. Milam Glacier TrekkingThis would be the very long and real day during this trek and see the cold beer and the hot showers. Stay overnight at the camp. Himalayan Trekking Tour IndiaAfter having breakfast, travel back to Almora. Arrive and check in to the hotel. RishikeshFrom Almora, transfer to Rishikesh. On arrival at Rishikesh, check in to the hotel. In time, transfer to the Haridwar railway station to board the train to Delhi. Arrive at Delhi, have dinner at one of the many famous restaurants, later transfer to the international airport to connect the flight back to the onward destination. The tour ends.